Based on the immunogen sequence, the antibody recognises several isoforms of MUC1 (Uniprot ID P15941). They are Isoform Y (28 kDa), Isoform Y-LSP (28 kDa), Isoform S2 (17 kDa) and Isoform J13 (28 kDa). Synthetic peptide corresponding to Human MUC1 aa 1-100 (N terminal). T47D, MCF7 and A549 cell lysates, human kidney, human breast carcinoma, human thyroid carcinoma, human colon cancer lysate, human fetal lung lysate, rat liver lysate and mouse liver lysate. Isoform 7 of MUC1 behaves as a receptor and binds the secreted isoform 5. The binding induces the phosphorylation of the isoform 7, alters cellular morphology and initiates cell signaling. The mouse and rat recommendation is based on WB results. Our Abpromise guarantee covers the use of ab45167 in the following tested applications. WB 1/1000. Detects a band of approximately 27 kDa. 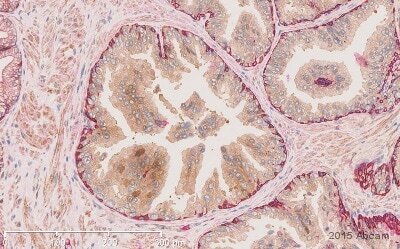 Immunohistochemistry (Frozen sections) - Anti-MUC1 antibody [EP1024Y] (ab45167)This image is courtesy of an anonymous abreview. Unpurified ab45167 staining MUC1 on E14.5 mouse gut epithelium by IHC-Fr. The tissue was formaldehyde fixed and then blocked for 1 hour at 25°C. The primary antibody was diluted 1/400 and incubated with the sample for 16 hours at 4°C. An Alexa Fluor 488 conjugated goat anti-rabbit antibody was used as the secondary. 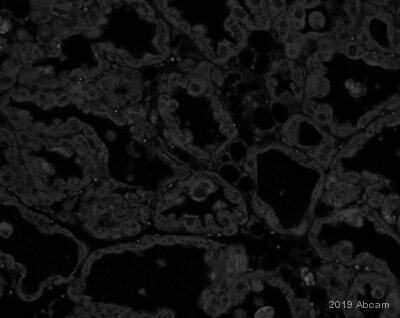 Immunocytochemistry/Immunofluorescence analysis of MCF7 (Human breast adenocarcinoma cell line) cells labeling purified MUC1 with ab45167 at 1/500. Cells were fixed with 4% paraformaldehyde and permeabilized with 0.1% Triton X-100. ab150077, an Alexa Fluor® 488-conjugated goat anti-rabbit IgG (1/1000) was used as the secondary antibody. Nuclei counterstained with DAPI (blue). 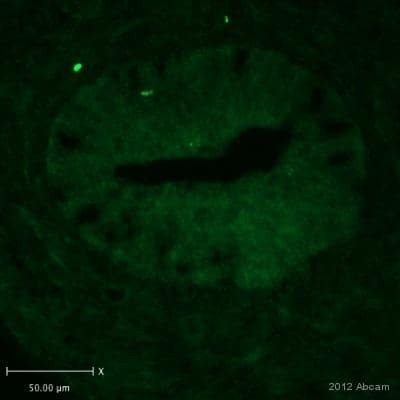 Confocal image showing membranous staining on MCF7 cell line. Negative control: HCT-116 (PMID: 14998492). Flow cytometry analysis of T47D (human mammary gland ductal carcinoma) cells labelling MUC1 with unpurified ab45167 (pink) at a dilution of 1/150. Cells were fixed with 2% paraformaldehyde. A FITC-conjugated goat anti-rabbit IgG was used as the secondary antibody. Rabbit monoclonal IgG (ab172730) was used as the isotype control (green). ab45167 (purified) at 1/20 dilution (2ug) immunoprecipitating MUC1 in Human fetal lung lysate. Flow Cytometry analysis of A549 (human lung carcinoma cell line) cells labeling MUC1 with purified ab45167 at 1/20 dilution (10 ug/ml). Cells were fixed with 4% paraformaldehyde. A goat anti-rabbit IgG (Alexa Fluor® 488) was used as the secondary antibody at 1/2000 dilution. Black - Isotype control, Rabbit monoclonal IgG. Blue - unlabeled control, cells without incubation with primary antibody and secondary antibody. Observed band size: 27 kDa why is the actual band size different from the predicted? I have a quick question regarding your anti-MUC1 antibody [EP1024Y] (ab45167). I am not able to find any images of its use in combination with a fluorescent secondary antibody, do you know if it is suitable for this purpose? As shown on the product datasheet, ab45167 is not suitable for ICC/IF but it is guaranteed for IHC-Fr, WB, IHC-P, Flow Cyt, IP and on Mouse, Rat, Human samples. Regarding the use of ab45167 in fluorescent detection method, we have an image for IHC-Fr where an Alexa Fluor 488 conjugated goat anti-rabbit antibody was used as the secondary. Hi, I was wondering if you could please send me what conditions were successful for this antibody for IHC paraffin embedded tissue? I saw 1:100 - 1:250 is the suggested dilution with antigen retrieval. Can you please tell me what percentage of block is recommended and for how long? Any information you can offer would be greatly appreciated. I have attached the protocol used by the lab for ab45167 anti-MUC1 antibody. The exact concentration that works best in your samples will have to be determined experimentally but we do recommend the starting range which you noted.I hope you find this information is helpful. What is the immunogen sequence for ab45167 and does it map to the extracellular domain on the mouse MUC1?